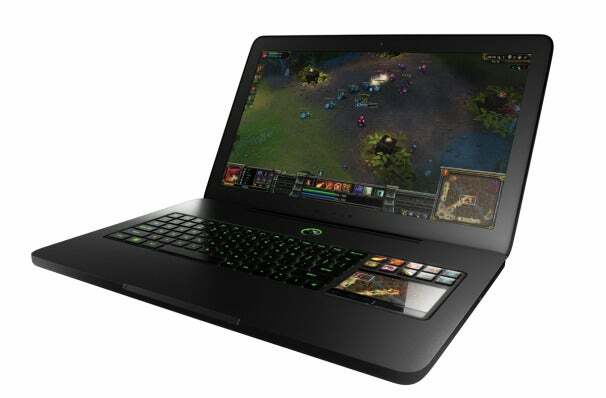 Razer wants to convince you that the future of PC gaming lies in a $2799 laptop. The first "true" gaming laptop, actually -- the pretenders to the throne that've come before might've been laptops capable of playing games, but they believe that the Razer Blade is the first to offer real portability, and great performance, without sacrifices. Earlier this week Razer CEO Ming-Liang Tan swung by PCWorld's offices and gave me a sneak peek at a prototype of their first real foray into the PC business. I had to muzzle my inner cynic (Razer Blade? Really? ), but ultimately wasn't disappointed. I daresay impressed, even. I can't speak to whether or not this will actually spark a PC gaming renaissance (or if we're even in need of one, really), but Razer is certainly on the right track. Specs will make or break a gaming system, and the Blade is no slouch. When it starts shipping sometime this holiday season it'll sport a 2.8GHz Intel Core i7-2640M processor, 8GB of RAM, an Nvidia GeForce GT555M discrete graphics card, and a 320GB hard drive. There are no other options, as Razer is only offering one SKU. The decision makes sense: the company purchased an ODM (original device manufacturer) to get full control over the design of their hardware. Limiting the variations keeps things simple -- this is their first PC, so if they're going to keep production up while maintaing quality, they'll want to start small. You can do better -- the Asus G73SW offers fairly similar guts for about $1650. Razer hopes to make up the cost difference with a focus on design and a strong feature set. The Blade, quite frankly, is gorgeous. It's constructed out of a single slab of aluminum, much like Apple's unibody MacBook Pros. The LED-backlit, 17-inch display is bright and gorgeous. Viewing angles were impressive too -- you likely won't find yourself spending too much time looking at your laptop from extreme angles, but the Blade has you covered. Luggability likely isn't too high on the list of many a gaming laptop enthusiast -- if you're looking for plenty of raw power, you aren't going to find it in a svelte package. That said, the Blade weighs in at just under 7 pounds, which puts it at the lower end of the desktop replacement category. It's also less than an inch thick, which makes storage and toting it about a feasible prospect. Even the power brick has been redesigned into a teensy slab, making for an all-around totable package. Razer makes keyboards, so it should come as no surprise that they chicklet-style keys built into the Blade are feature-rich. The laptop's keyboard offers full anti-ghosting technology, which is a must for keyboard warriors. In brief: "Ghosting" is the quasi-technical term for a keyboard's unresponsiveness when multiple keys are mashed at once. It's a fairly standard feature on gaming-grade keyboards, but you'll be hard pressed to find similar tech in many laptops. 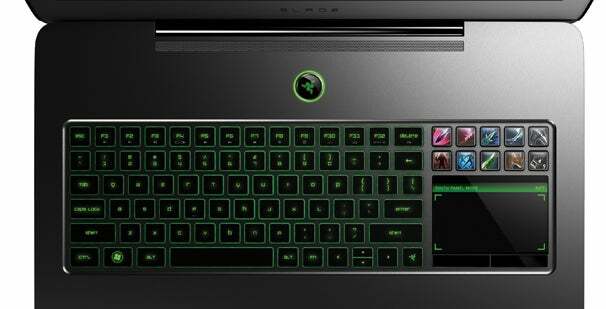 Razer's also rather fond of customization, so you'll be able to re-map every single key on your keyboard, as well as set up customized macros, using Razer's software. Alas, while the keys are backlit (in green), you won't be able to change the colors. Some of Razer's wares offer tri-color backlighting, but they've decided to keep the frills to a minimum here. 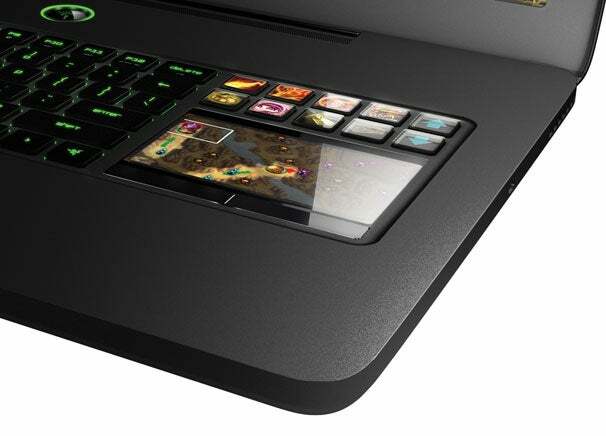 Here's something you won't find anywhere else: Razer is implementing the technology from their Switchblade netbook-concept into the Blade, in the form of a multi-purpose LCD panel sitting to the right of the full-sized keyboard. It works much like it did on the prototype we saw back at CES. There are 10 translucent keys, set over an LCD panel. You can customize the keys however you like, from creating custom macros to creating your own thumbnail art and assigning it to the buttons. The lower half of the LCD serves as a touchpad, under normal use. Plug a mouse in, and that lower half can serve as a secondary display. It's utility can vary from game to game -- examples include setting it to keep an eye on particular waypoints in a match on League of Legends, or simply using it to keep track of your character's stats in World of Warcraft. There will ultimately be an open API, so users will be able to create their own applications and functions. I saw this tech in action at E3 just a few months ago, on Razer's upcoming Star Wars: The Old Republic gaming keyboard. Once the open API drops, an app written for the Switchblade UI will work across all devices that offer the panel. Memories of the wildly popular LCD panel on Logitech's G15 keyboard suddenly come to mind -- here's hoping the modding community takes as much of a shine to a gorgeous, fully configurable multi-touch screen as they did to a monochrome display that offered a room for a few lines of text.